We aimed to assess the role of the nitric oxide (NO)–cGMP pathway in cardioprotection by brief intermittent ischemias at the onset of reperfusion (i.e., post–conditioning (Post–con)). We also evaluated the role of coronary flow and pressure in Post–con. 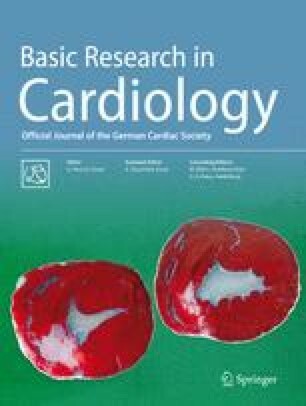 Rat isolated hearts perfused at constant– flow or –pressure underwent 30 min global ischemia and 120 min reperfusion. Post–con obtained with brief ischemias of different duration (modified, MPost–con) was compared with Post–con obtained with ischemias of identical duration (classical, C–Post–con) and with ischemic preconditioning (IP). Infarct size was evaluated using nitro–blue tetrazolium staining and lactate dehydrogenase (LDH) release. In the groups, NO synthase (NOS) or guanylyl–cyclase (GC) was inhibited with LNAME and ODQ, respectively. In the subgroups, the enzyme immunoassay technique was used to quantify cGMP release. In the constant–flow model, M–Post–con and C–Post–con were equally effective, but more effective than IP in reducing infarct size. The cardioprotection by M–Post–con was only blunted by the NOS–inhibitor, but was abolished by the GC–antagonist. Post–ischemic cGMP release was enhanced by MPost–con. In the constant–pressure model IP, M–Post–con and C–Post–con were equally effective in reducing infarct size. Post–con protocols were more effective in the constant–flow than in the constant–pressure model. In all groups, LDH release during reperfusion was proportional to infarct size. In conclusion, Post–con depends upon GC activation, which can be achieved by NOS–dependent and NOS–independent pathways. The benefits of M– and CPost–con are similar. However, protection by Post–con is greater in the constant–flow than in the constant–pressure model.